Vitamin C, also known as ascorbic acid, is one of the essential vitamins required in the human body. It is a vitamin that can be found naturally in the human body though it is water-soluble, which means it is not stored in the body. Therefore it’s important to have a continuous supply of vitamin C, which we generally achieve by eating and drinking things that contain vitamin C. Although it is most commonly found in various fruits and vegetables, there are other sources from which we can obtain our vitamin C as well. Another important element found in fruits and vegetables is lycopene. Lycopene is a bright red carotene pigment, so the best places that you find it is in fruits and vegetables that are red. Although lycopene is not necessarily essential for our bodies, it is has many potential health benefits as well as antioxidant properties. Adequate intake of vitamin C is useful for a variety of reasons. It is absolutely necessary for the growth and repairing of skin tissues and is most commonly known for its ability to improve the quality of the immune system in the body. One way that it achieves this is by reducing the stress level in the body, which can be one of the culprits behind a weakened immune system. Vitamin C cannot rid the body of a common cold, however it can help to prevent complications for those that suffer from colds. Another wonderful effect that vitamin C has on the body is that it has the ability to reduce the effects of aging, such as wrinkles and creases in the skin. Other studies have shown that those with a higher intake of vitamin C suffer fewer strokes. Similar to lycopene, vitamin C also has many antioxidant properties in the body as well. The benefits lycopene has on the body are also important. For instance, lycopene can help prevent the build-up of dangerous lipids in the body, specifically in the liver. Build up of lipids in the liver can lead to fatty liver disease which can lead to serious complications in the body. Lycopene has also been studied for having potential anti-cancer properties to it as well, though there needs to be more research done in regards to this. According to more recent studies, it has been shown that generally only 10 to 20 percent of men and women actually get the amount of vitamin C needed. When looking to make sure you get a sufficient amount of vitamin C, it is good to try and get it from as many natural sources as possible. This vitamin can usually be found in most fruits and vegetables though sometimes it can be hard to get all that’s needed out of the required number of servings of fruits and vegetables. In this case, it can be possible to retrieve vitamin C from other sources that are high in vitamin C as well. 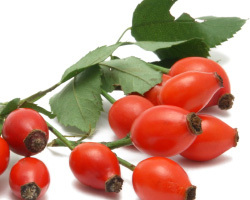 One exceptionally good source of vitamin C is from rosehips. Rosehips are usually found at the base of wild roses, just beneath their flowers. It can be used in many ways, but it is most commonly made into a vitamin rich tea. 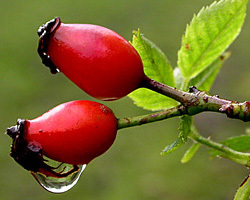 According to studies, rosehips tea has a much higher concentration of vitamin C than any citrus fruit. 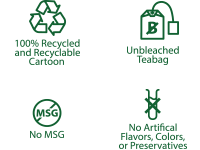 This is great news for those that have a hard time taking in the necessary amount of vitamin C. If you happen to be one of those people, rosehips tea is definitely a good option to consider. 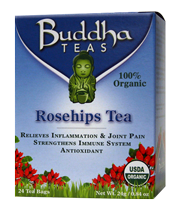 Recently, rosehips tea has also shown itself to be a relatively new source of lycopene. Although the amounts of lycopene in it are small it is still a notable benefit that is good to keep in mind for those looking into ways they can increase lycopene in their systems. Are organic choices healthier for you? Find out the differences between organic and non-organic produce and just how they affect you.